ARoNite harnesses the power of naturally occurring autotrophic bacteria to reduce nitrate contamination in water. Autotrophic bacteria convert oxidized compounds through a natural reduction process absent of a traditional carbon source – ARoNite creates the optimal environment for these types of bacteria to flourish and perform. At the heart of every ARoNite system is the hollow fiber media that serves as both a biological growth platform and gas delivery substrate to support the natural reduction process. In simple terms, the ARoNite hollow fiber media creates the perfect environment for the bacteria, as it allows biofilm to grow directly on its “food” source. Hydrogen and carbon dioxide are delivered across the hollow fiber media under slight pressure. The autotrophic bacteria assimilate inorganic carbon from the alkalinity, phosphorus, and other trace nutrients from the influent stream to build cell mass. Influent nitrate is then reduced to innocuous nitrogen gas and released into the atmosphere. 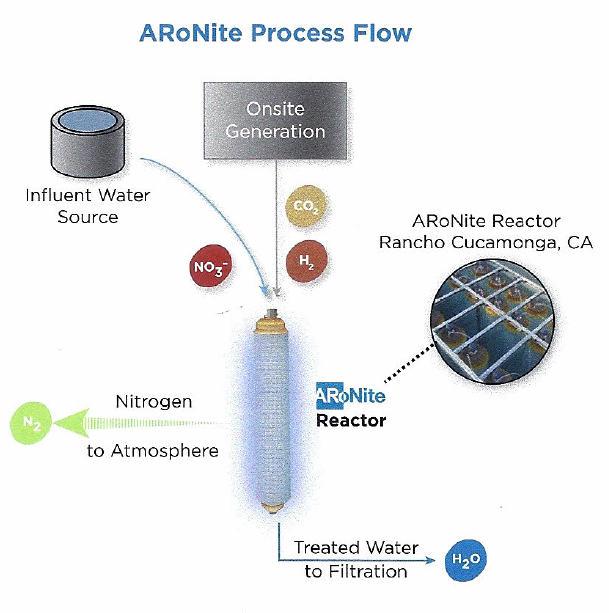 As a result, the ARoNite system destroys the contamination without producing waste by-product. The process is simple and elegant. With a few inexpensive inputs (influent water, power, hydrogen, and carbon dioxide), we solve notoriously difficult water challenges without creating hard-to-manage brine’ or waste by-products. As a result, the process eliminates costs and complexity issues associated with traditional technologies in the market. Hydrogen is produced on-site and on-demand, thereby eliminating issues with gas handling and storage. Influent water is pumped through the reactor at flows up to 40 gallons per minute. Inside the reactor, the autotrophic bacteria reduce nitrate to nitrogen gas which in turn is released into the atmosphere. Treated water is sent downstream to filtration and disinfection before it is distributed into the local drinking water supply.